How do I search through these files? 2. Click on one of the pdf links on the previous page. Then, click on the binoculars or choose Find from the Tools menu. !!Note!! Acrobat will not allow searching across multiple files if it is launched from within a browser; you can only search the PDF file you are looking at. This is fine if you want to search one book or magazine issue. To search across all the teachings, you need to launch Acrobat from Windows directly, and then open any of the PDF files in the C:\Teachings folder (assuming that you selected this default folder setting during installation.) When you click on the binoculars to open the search window, select the radio button labelled "All PDF Documents." Finally, specify again the Teachings folder as the place you want to search. Now your search will span all the books and magazines. Acrobat offers advanced search options, which are explained in the Acrobat Help system. Note: The CD version contains a complete index of all the magazines and books. This is what allows searching for a word or phrase across all the writings. The CD version also includes a larger, higher-resolution version of the Anurag Sagar of Kabir, which brings out the beauty of the color images even more. As mentioned above, Acrobat is at it's best when run directly from the Program Menu, without a browser "in the way." We tried to name all the files logically so that you can access them directly from Acrobat. For example, if you go to Acrobat's File menu and select Open, you will see a list of all the files in the Teachings folder. Ambrosial.pdf is the entire book "The Ambrosial Hour" and Naam.pdf is the entire book "Naam or Word." And SB198704.pdf is the April 1987 issue of Sant Bani Magazine. Double click on the file that you wish to read. You can also load multiple files into Acrobat, and use the Ctrl-Tab key combination to quickly switch between the files. Sant Bani magazines were scanned from cover to cover, except for the publications catalog page located inside the back cover. These were removed from the files to allow for more meaningful searches. 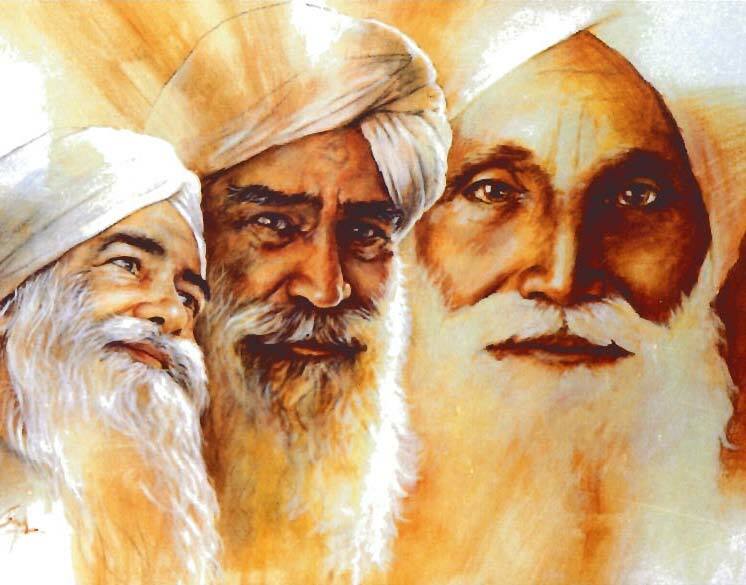 For example, if you searched across all the writings for the phrase "Jaimal Singh", and the catalog pages had been left in, you would recover hundreds of hits on "Baba Jaimal Singh: the story of a great Saint" which was in the catalog. All books and magazines were scanned in black and white at 300 dpi, using a Fujitsu ScanSnap scanner. The color and grayscale pages were scanned with an Epson 3170p at 300 dpi, with descreening filter, and then replaced into the correct locations in the document. Each file was indexed to make it individually searchable, using a process called "paper capture." This extracted the words from the graphic images created by the scanners, and created a "layer" of searchable text that lies behind the image of each page. It also compacted the files and made sure that the margins were straight. Finally, the entire contents of the CD version, about 18,000 pages were "cataloged" so that they can be searched as a group. There are a number of pages that combined somewhat dark photos with normal text. Where there was a clear choice between image quality and maintaining proper contrast for the indexing engine, we opted to make the page more searchable. In the future, it may be possible to revisit those pages and improve the images. A note on search accuracy: Acrobat does a good job in converting the images of the pages into searchable text, with one exception: if the top of the page contains a photo with two text columns beneath, Acrobat can fail to index the second column on the page. If a target word is located there, it may not appear in your search results. As Acrobat improves, we hope to solve this problem. We have kept original versions of all the files for this purpose. A rough estimate is that this problem changes search results by less than .5%. Acrobat 6 offers the option to read the text out loud to you, using the speakers connected to your computer. Open the View menu, and then select Read Out Loud. This feature is not 100% reliable, and requires that your computer have a sound card and speakers. The voice is also very synthetic-sounding. Still it could be a useful feature at some point. We'd like to thank again all those who worked so hard to make these books and magazines available over so many years. Thanks to Jonas Gerard for the use of the beautiful painting (shown below, from the "Ambrosial Hour") printed on the discs, and many unnamed photographers for the wonderful pictures used on the home page. Thanks finally to those who loaned treasured and well-worn copies of out-of-print Sant Bani Magazine issues, to make the sequence complete. Please forgive us if we have made errors in the production or presentation of this archive. We hope that you find the teachings here to be an inspiration on your way back to God.